Irritable bowel syndrome (IBS) is a functional disorder affecting the gastrointestinal tract whereas celiac disease is an autoimmune disease of the GI tract. Celiac disease results from a reaction to a protein called prolamin which is found in various cereals such as wheat, barley, soya etc. This protein modifies the peptide called transglutaminase and results in an inflammatory reaction in the gut. Due to the inflammation along the villi of the small intestines, there is interference with the absorption of the nutrients that leads to weight loss and nutritional deficiencies. There is also a genetic linkage responsible for celiac disease. But majorly, prolamins are the proteins responsible for an auto immune reaction in celiac disease. The exact causative factor for IBS is not known. The factors that predispose the onset of this disorder are a strong family history, stress, and an acute episode of a gastrointestinal infection. The signs and symptoms for both the conditions are similar and overlap each other. The characteristic symptom of celiac disease is the stool being greasy, pale, loose and containing fat (steatorrhea). The other symptoms include abdominal cramps, bloating, distension, and nutrient malabsorption symptoms such as anemia, recurrent mouth ulcers, etc. The consequence of this chronic disease is long term deficiency of vitamin D, with other fat soluble vitamins such as A, E and k. Due to non absorption of carbohydrates, fats there is weight loss. The other deficiencies include that of iron, copper and selenium. The patient with IBS mainly presents with abdominal discomfort with persistently alternately diarrhea and vomiting. There is always pain in abdomen with urgency to pass stools or complete inactivity of bowels. Along with these symptoms, gastro esophageal reflux with eructation and flatulence are seen. The symptoms vary in intensity with psychological stress, anxiety and depression. There is no weight loss, or any other detectable pathology in IBS and it is believed that it is just a hypersensitive gut with poor pain threshold. There are no specific blood tests for IBS that would conclude or confirm the diagnosis. It’s the symptomatic presentation along with personal and family history that confirms the disease itself. However, a complete blood count along with a stool routine and liver function test are done to rule out celiac disease and other gastrointestinal conditions. IBS is a diagnosis of exclusion. The hallmark feature of diagnosing celiac disease is the presence of steatorrhea in a stool routine test. The serological tests include detection of anti-reticulin (ARA), anti- gliadin (AGA) and anti- endomysium (EMA) antibodies. Endoscopic examination also confirms the diagnosis in cases of celiac disease. The small bowel appears prominent with a characteristic mosaic pattern also called as ‘cracked mud’ in appearance. Both IBS and celiac disease affect the intestine resulting in pain and discomfort. However, IBS is a functional disease with no pathology and is linked to hereditary factors and lifestyle modifications. Symptoms include alternating diarrhea and constipation with abdominal pain and distention. These symptoms are accompanied with gastrointestinal reflux symptoms and the attacks are often triggered by stress or dietary modifications. Celiac disease is an auto immune disorder in which the intestines are sensitive to proteins called the prolamin (gluten). The patients present with weight loss, diarrhea alternating with constipation, vitamin, protein deficiency symptoms and characteristically greasy stools. rachita. "Difference between IBS and celiac disease." DifferenceBetween.net. 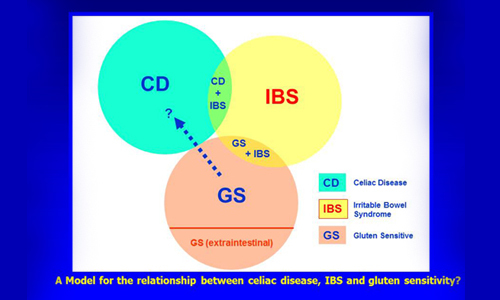 November 25, 2014 < http://www.differencebetween.net/science/health/difference-between-ibs-and-celiac-disease/ >.